A kayak anchor trolley helps an angler quickly and easily adjust the tie-down location of the anchor on their kayak. It also makes it much easier pulling the anchor up by allowing the tie-down to move toward the angler in a more convenient and easier place to access. This flexibility provides total control for the angler when anchoring in any type of water. It’s worth investing in a kayak anchor trolley, and the good news is they’re much more affordable than they sound. Two eye loops are attached to the hull on one side of the kayak, roughly the length of the kayak. With the rope in place, the angler can now slide the position of the ring to either the bow or the stern, wherever he’d prefer the anchor line to be set. If you plan on fishing in any kind of current, even in small ponds and lakes, there will be a time where you won’t want to drift from your spot. Being in the middle of a hot bite is not the time to drift away to a different location. Just tying an anchor off to a specific location on the kayak won’t work because of the size of the boat and the direction your current could take you. With a kayak anchor trolley, you control the exact location of the tie off to optimize the position of your kayak. As the video showed, that angler preferred to have his anchor line attached to the back of the boat. But that happened to be for that situation. It may not be the same each time. That flexibility is critical when fishing, which is why a kayak anchor trolley is a no brainer for any angler on a kayak. Are kayak anchor trolleys expensive? Absolutely not! At the time of this article’s writing, several kayak anchor trolleys could be found on Amazon. There are several offerings out there you just need to pick the one that’s right for you. 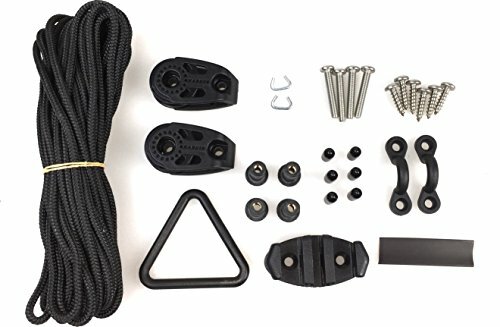 We’re partial to YakGear’s Deluxe Kayak Anchor Trolley kit, but there are several very good options out there. You can find what you’re looking for on Amazon. Don’t forget you’ll need an anchor, too. We like KWIK TEK's A2 Complete Folding Anchor System. It’s 3 and 1/3 pound in weight, has four flukes and comes with 25 feet of durable, marine-grade rope. It also includes a float and a clip for easy on, easy off attaching to the kayak anchor trolley. Check it out and see for yourself why it’d work for you and your kayak. Add more control to your versatile kayak by installing a kayak anchor trolley. You won’t regret the added benefits of having it. Anchoring should be easy and with a kayak anchor trolley, it is. Tight lines!